It’s the damnedest of things when your 6-year-old daughter’s favorite games are Barbie’s Dreamhouse, Hello Kitty Nail Saloon and… notmycar. She even managed to score second place quite a few times already. True story! Not bad for a vehicular Battle Royale game with 40 starting players, most of them probably already rocking a beard or with kids themselves. Sure, she can’t quite grasp the concept of weapon tiers and has a hard time picking up anything, let alone actually shooting anyone. But she manages to stay inside the circle, drive like hell when being shot at and slalom through incountable trees. Not bad for someone who grew up on Talking Tom and coloring games. 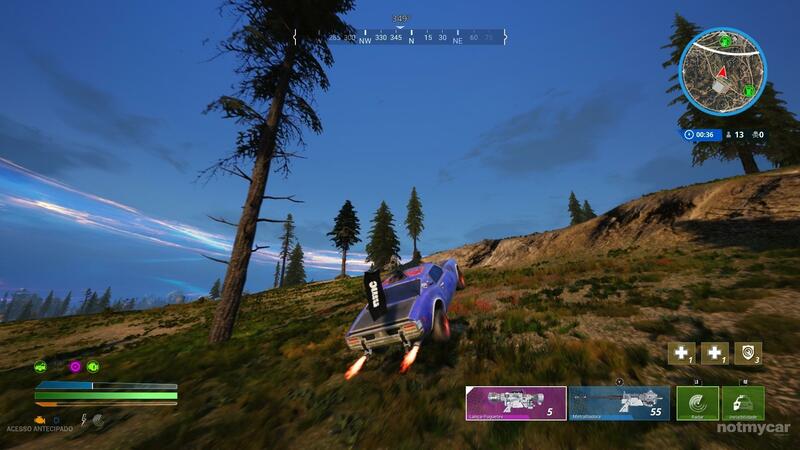 Anyway, notmycar is a Battle Royale with cars currently in free Early Access and while it’s not the first one to come up with the idea, it’s completely focused around the concept of cars shooting each other until there is only one left standing. The slogan Twisted Metal meets PUBG isn’t too shabby to describe it. The approach is standard fare, with the 40 cars dropping from a plane and growing wings – unlike Fast and Furious where parachutes were used. The developers plan on increasing the number of cards steadily up to a much enticing 100. Being Early Access, there isn’t much to choose from right now. Your garage has three different cars and an exclusive Founder’s vehicle, but customization is bare-bones to say the least – pick from a few colors and your favorite flag and you’re done. Obviously, you can go to the store to purchase some additional cars and other cosmetics or go for the Season Pass if you’re in this for the long haul. 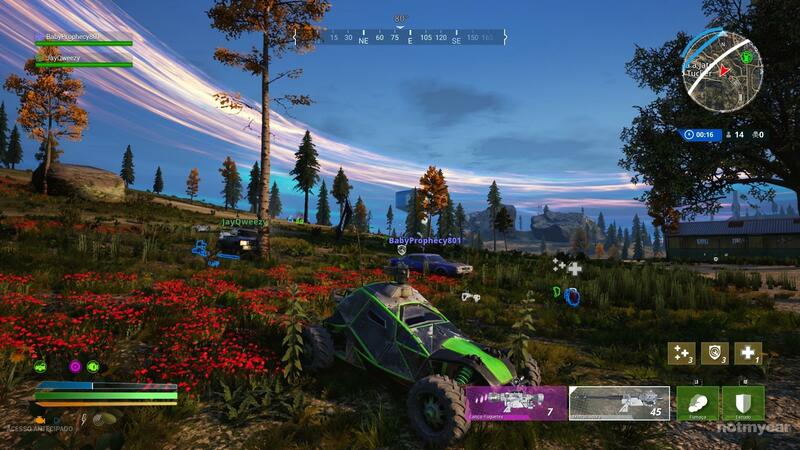 Cars are said to be unlocked through gameplay progress as well, so let’s hope they aren’t too tightfisted when it comes to this – constantly battling the same cars becomes boring quickly. There are three game modes currently available. You can train your driving and shooting skills all by yourself, play solo or in a squad of three players. As soon as you drop in the island, it’s pedal to the metal in an effort to find the best weapons and armor. These come in the traditional color-coded variants: Gray is Common, Green is Uncommon, Blue is Rare, Purple is Epic, and Gold is Legendary, but this one is only available through supply drops. You’ll know when these are bound to happen as you won’t fail to notice the annoying helicopter rotor sound as well as the red smoke. You also have some weapon add-ons such as faster reload or increased accuracy, along with abilities: cloaking, shield, smoke screen and a few more. Being a Battle Royale, a shrinking circle will frequently push all the players together. And now for some personal details and constructive criticism. notmycar is fun to play… as soon as you get to grips with the handling. It feels a bit floaty, but nothing that you can’t work out by messing with the controller options as well. Aiming, however, is a completely different beast, as recklessly driving while trying to aim your mounted cannon isn’t an easy task. Blame it on the game or not, I find it hard to make the shots count, but I’ve seen some players doing it effortlessly, which probably means that I’m just crap at it. Gun sounds also seem a bit off. It’s not unusual to become afflicted by noise that sounds far closer than normal, but there is no one in sight. But my main pet peeve with notmycar is the absolute lack of a car damage model system, both visual and practical – when you consider that Destruction Derby did it way back in 1995, obviously ignoring the blatant generation leap and distinct technological challenges, this would help immersion quite a bit. Then again, I’m pretty sure that this isn’t a priority on the to-do list and sadly will never be a part of notmycar. Currently, notmycar has a negative rating on Steam but this isn’t due to the quality of the game or the fun matches that it provides. It is related to server problems, with lag and disconnecting issues being on top of the complaints. Personally, I’ve fallen on the lucky side of the deal, with only a handful of bugs and nothing that would be able to change my perspective on the game – it’s Early Access, it has issues, but the potential and most importantly the fun factor is there. While these problems could and should have been smoothed before entering this testing stage, it’s worrisome to see a game’s reputation tarnished so early in development. But I enjoyed the fast and furious gameplay of notmycar. It does what it sets out to do and when things start clicking into place, especially server stability and car handling, it can be an interesting choice. Heck, if even peace-loving, nail-painting, 6-year-old get some enjoyment out of this game and manages to seize several second places, it must be doing something right.